International doll show in Asheville NC, June 5-7. Come to see my porcelain dolls and other beautiful dolls. This looks like a great show! I hope I can attend someday when my business has grown. It would be worth it just to see your beauties in person. Thank you for posting! Is anyone else going? Not for the first time I wished I didn't live on a different continent! I would love to attend! 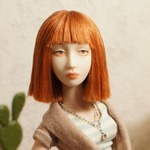 Yes Allurose, my dear friend Yana, who make Bidolls going too. I think we will be just two porcelain artists there this year. Good luck Larissa- I hope it goes very well for you and Yana! Thank you very much Snegurochka!!! I will post pictures here for people who can't come to the show. Congrats and yes please post lots of photos. Any kinds of dolls - whatever you think we would all like. Oh yes, I love to see photos of booths and of the crowd, to get the feel of the turnout. Someday I will travel to many conventions and it will be hard to pick which ones! Wishing goodluck to you Larisa and to Yana. I am sure all your dolls will find their new forever homes. They are all very beautiful and you did an amazing job of putting this collection together. PLEASE take lots of pictures of your dolls, other dolls, and Yana's as well. Larissa, thank you for sharing your photos! I am surprised you had time to take so many, you must have been very busy at your own booth too! I am sure you must have made quite a splash, and BiDoll too. Did you find the show gave you a good return? About how many people were there do you think? It looks like it was a lot of fun! Thank you Allurose!!! The show was very nice, but I have something to say - organizers of the show didn't advertise it very well. It was not crowded as I expected. Next year I will think about it - come here or not. I made my money, have fun, but serious collectors was not here, sad...I even didn't put my dolls to any contest because of the same reason. Other big disappointment was the Art doll guild ( and I am member here), how they run organization. I think everybody deserves some quality attention, the president of the Guild didn't bother to spent 5 minutes with me, but have lots of time with others. The doll show organizers need to put more time and attention for each exhibitor period. Stop from time to time, ask how we are doing and so on. I think I will go to other places next time to show my dolls. Because they didn't have proper attention here at all. And they are deserve it, so as me.